Forum › Announcements and News › Product Release › Reolink NEWEST 5MP Wireless 4X Optical Zoom RLC-422W Pre-Orders Open Now! This topic contains 1 reply, has 2 voices, and was last updated by audrdem 1 year, 4 months ago. 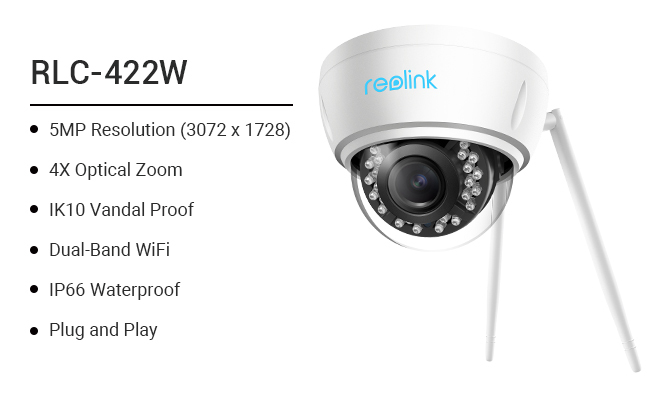 Thrilled to announce that Reolink has released the first product of its 5MP security camera series – RLC-422W. Get it now at USD 119.99 USD 89.99. Comment below if you have any questions concerning the RLC-422W. This topic was modified 1 year, 6 months ago by Community Manager. I would be more pleased if the new cameras were with the appropriate level of software than the better video resolution.